The weather is vile and my camera can't cope with the poor lighting today. Also my outfit is incredibly lazy...jeans, a t shirt and a cardigan! I am far too embarrased to show it! 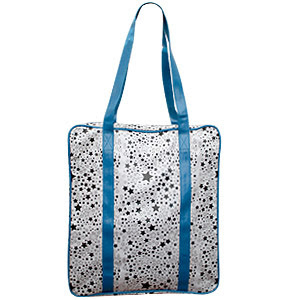 So instead, I thought I'd talk about something that I have realised is a staple for me...a canvas shopper! I never use handbags, or rarely. I look at them, I sometimes even buy them, but every day I use a different shopper of some kind. I used them all the way through 6th form and uni because I could fit my folder into them, but since graduating have just continued! I dread having a 'real' job and having to get a smart handbag! I just got this one from Alphabet bags. Topical, no? This website have a large number of bags, and you can get one for each letter of the alphabet! This one is currently on sale at Dolly Dagger (an amazing website full of things I can't afford) It looks really roomy- important for me and all the rubbish I cart round with me on a daily basis. Ah I love cute totes. I love the recession bag. It looks like it would hold everything. Love the star print one. Hahaha, oh, that bag is awesome! I always try to cram too much into a handbag and then have to put it all into a canvas tote instead, lol. 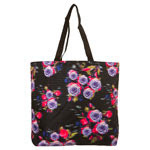 I love Topshop sales when they put the totes down to £1, Ive got some of my faves that way! That recession bag is priceless! 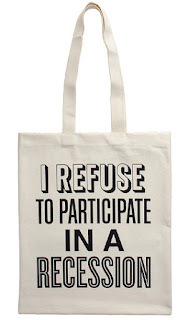 And much more fun than the ubiquitous 'this is not a plastic bag' bag. haha i love that first bag!